Business names- Why Abstract names are better for business. Christening your business with an abstract or seemingly random name might seem like a mad idea. After all these ‘blind’ business names usually give no indication to new customers of what the company actually does. Consider though, that some of the most successful brands in the world chose abstract business names and they probably didn’t leave it down to chance (Think Starbucks, Apple, Shell, Yahoo and Puma to name a few ). These brands have certainly proved themselves to be powerful but why are their names so effective? We’ll take a quick look at why abstract branding does the job so well, and explain the method in the ‘madness’. When choosing business names, it is tempting to go for one that describes the core business- did someone say “It does what it says on the tin?”. For example, if the company produces widgets and is based in the North West, ‘North West Widgets’ would be an obvious choice. However, such a choice can be a dangerous one, especially if the company unexpectedly has to move north or widgets become obsolete. Whatever future direction the company takes, it will forever be associated with the original widgets it used to produce. Real life examples such as ‘Good housekeeping’ Magazine and ‘the Carphone Warehouse’ in the UK come to mind- These businesses have evolved but their names are unfortunately stuck in the past. If absolute proof were needed of the power of abstract branding, one need look no further than the world’s leading online retailer and the internet’s leading search engine, both of which use abstract business names – Amazon and Google. The choice to ‘go abstract’ was not arbitrary, both companies knowing full well that in order to achieve the success and expansion they now have, the brand name would need to both initially connect with potential consumers and then become ingrained in their minds. Whereas some successful companies rely on their logo for branding, abstract names avoid such dependency, often becoming part of the language itself and working their way into people’s everyday conversations. Almost any corporate logo can then match the flexible nature of the abstract branding, with designers having limitless possibilities available to them. With so much depending today on a company’s online presence, competition for unique business names has become intense. Anyone who has ever tried to register their ideal domain name knows the frustration of discovering that someone else got there first! Abstract names are by their very nature unique, making them easier to register and easier to protect. They are also easier to remember than a long (and often boring) traditional name. What’s more, they are harder to abbreviate- Why is this a good thing? Well, as humans we tend to shorten names that are 4 syllables long and over. Let’s pretend the fictitious company ‘North West Paper’ is successful photocopier paper business. All their loyal clients call them ‘NWP’ for short. This is all well and good until a copy cat rival comes along and calls themselves ‘North West Copy’ or NWC for short. They look, sound and behave so similar that customers are confused. The result is that NWC are able to poach some of NWP’s hard earned clients. Whether naming your own business or helping a client name theirs, think ‘abstract’ and you will avoid this scenario. 4. Abstract business names stand out. As well as being profound in printed form, the less obvious power of an abstract names is that they stand out from the spoken sentence. The very first time you heard someone say “I bought it on Amazon” your ears pricked up because we are hardwired to pick out irregularities in speech. The statement “I bought it from ‘WeSellBooksOnline.com’ probably wouldn’t have had the same impact and would certainly not be as immediately memorable. At Gorilla we do sometimes get strange looks when we tell people our name but one thing is for sure- they never forget us. While it is true that Abstract brands might require an initial explanation in the short term, the long term benefits are huge. Every company has to diversify at some point in order to survive, new, sometimes unusual opportunities can present themselves, often tempting a company out of its comfort zone. By choosing an abstract name from the start you can be sure that your branding is future proof- whatever possibilities may appear, your name will be versatile enough to accommodate them. 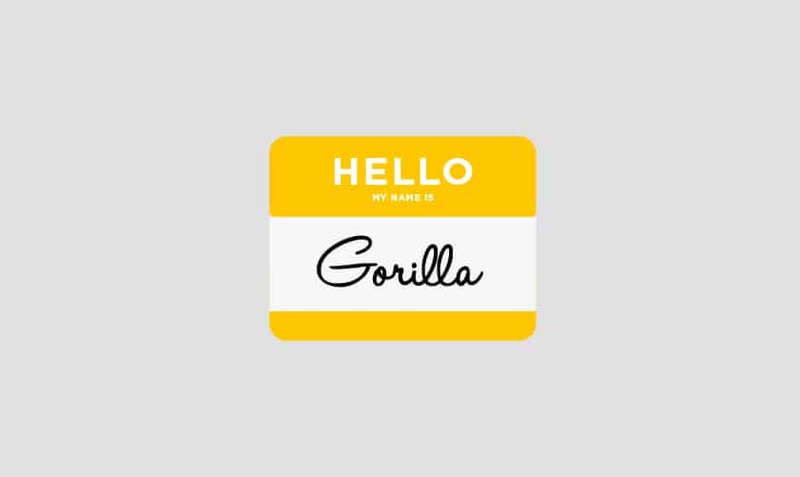 Gorilla have excellent experience in helping companies of all sizes find the perfect name. If you would like advice or help naming your new business then get in touch here.